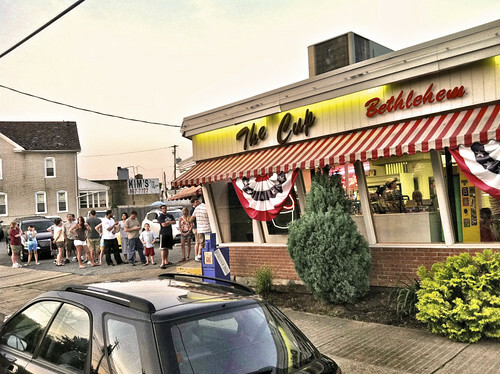 Bethlehem's Dairy Store (Also known as "The Cup") has been serving its homemade ice cream for over 85 years. I distinctly remember my dad bringing me here after one of his softball games and his growing impatience as I changed my mind no less than 12 times on what kind of ice cream I wanted. Rainbow sherbert, or maybe butter pecan. Chocolate chip mint? Raspberry? Tonight I got the yellow vanilla. Remember when you were a kid and the adults always seemed to get the boring vanilla or chocolate flavors? Maybe that's because they knew the secret of how something so simple could taste so good. I wasn't going to go to The Cup tonight. (The line out the door is typical and actually quite fast moving, as a squad of high school students move at lightening speed to serve the crowd.) I actually wanted something icy cold like a slushie on this 90 degree day but then I bumped into the Old Man as I was walking to my car. "WHAT ARE YOU DOING?" (Old Man is hard of hearing and always sounds like he's yelling) I told him I was going for some ice cream or something cold on this hot day. "YOU DON'T NEED THAT, IT'S NOT GOOD FOR YOU." I said I know, but that I wanted something cold... on this really hot day. I asked him if he wanted something. "I DON'T WANT ANY OF THAT. I DON'T NEED ANYTHING." I ask him, "Are you sure? I'll get you something if you want it." "NO THANKS. ONCE IN A GREAT WHILE, MAYBE ONCE A YEAR I'll GO AND GET A CONE FROM THE CUP. WHERE ARE YOU GOING?" I tell him I'm not yet sure but if he'd like me to get him something from The Cup, I would. "HELL NO. I DON'T NEED NONE OF THAT." Okay then, I tell him I will see him later. There were easily 50 people waiting in line when I got there but the line moved fast. I asked the girl to put a scoop each of vanilla and chocolate in a cup with a lid. The Jeff gets chocolate and some cookie dough and I get a pretzel cone with the yellow vanilla.